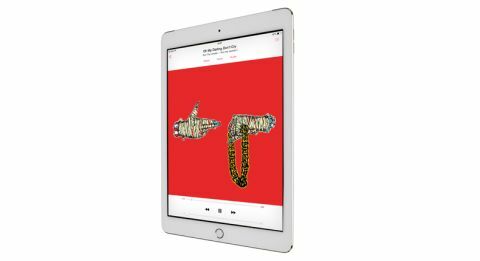 Apple iPad Air 2 review | What Hi-Fi? We were not sure it was possible, but Apple has done it. Apple has taken the best tablet ever made and made it even better. We’re well aware this opinion isn’t going to sit well with some people, but the fact is that when it comes to creating the best tablet experience on the market, the Apple iPad Air 2 delivers in every single way. First, let’s look at the design. No, the iPad Air 2 didn’t need to be made any slimmer than the slender Air, but Apple went and did it anyway, and at just 6.1mm thin, the result is stunning. Not only is it beautiful to look at, but it’s lighter too, which is noticeable in the hand and makes the Air 2 easier to hold for long periods. The Air 2’s build quality is as good as ever, and its newfound slenderness brings no feeling of weakness or fragility. In terms of overall design, it looks very similar to the Air 1 - except for the addition of the TouchID fingerprint sensor, distinguishable by the silver ring around the home button, and the lack of silencer switch, which is now an onscreen option in Control Centre instead. Finally, fans of the gold colour way will be pleased to see this added as an option in the iPad Air 2 too, alongside the previous space grey and silver options. While some devices have made the mistake of placing design over function, Apple hasn’t fallen into that hole. It might be slimmer, but there have been no sacrifices over its performance – in fact, it’s better than ever. At the heart of the iPad Air 2 is Apple’s brand new A8X processor, which promises to offer 40 per cent faster performance and 2.5x faster graphics. It absolutely delivers. Never when using the iPad Air did feel like it was slow or lagging, but using the iPad Air 2, you realise that there was more to be had. Swipes feel that little bit more immediate, taps a touch more responsive. Play a game and the better graphics performance is evident – we downloaded the stunning Epic Zen Garden graphical environment from the App Store, and the camera pans are silky smooth; we noticed the odd stutter on the older Air. There have been improvements to the screen too. While it remains the same resolution – a pin-sharp 2048 x 1536 – and the same size at 9.7in, it’s the actual make up of the display that’s been improved. The three separate components that make it up - namely the cover glass, the touch sensor and the LCD itself - are now fused into one, eliminating any air between them. Why does this matter? With the LCD layer closer to the cover glass, everything feels that little bit closer to you, popping a little more than on the Air. Icons feel closer to your finger and movies are that little bit more immersive. Colours are improved, too. We’ve always loved the iPad’s natural way with colour, but there is a touch of added vibrancy here. It’s subtle – nothing that would challenge the colour palette of our Korean friends at Samsung – but it’s richer nonetheless, and better for it. Video looks superb, and we’d say there’s even a touch more sharpness, no doubt thanks to the new screen technology. That’s not all: blacks are deeper, and contrast is better, with the stars on the standard iPad wallpaper popping through the purple-black sky with much more punch than on the Air. All this is topped off with a new anti-reflective coating that reduces glare on the screen by 56 per cent, making it clearer and more readable when used outside or under strip lighting than its predecessor. Audio performance is as strong as on its predecessor, and the Air 2 continues to lead the way for sound quality on a tablet. It’s an exciting listen, crisp and precise, with real drive and dynamism behind every track. Voices are direct and expressive, and there’s a touch more punch here as well, which adds more drive and enthusiasm to its character. It’s not high-res capable, but with a standard-res performance this good, you really don’t miss it. The Air 2's the speaker sound has been improved, with more clarity on offer, particularly in voices and midrange, which makes it great for movies when you’ve got no headphones. The slimmer body resonates a bit more at high volume than on the iPad Air 1, but we didn’t notice it affected the sound. We’d still love to see front-facing speakers on the iPad, like those on the forthcoming Nexus 9, for the most immersive experience. At the moment, you do notice the sound, albeit stereo, is coming from one end of it, and fires sound away and behind it rather than directly at you – for the best experience, you’ll want to use headphones. When it comes to cameras on tablets, we’re still not sold. But more and more people are doing it, and so Apple is investing in it. The camera on the rear has been upped to 8MP, with pictures more detailed and exposure better handled as a result. It now comes with the ‘Slo-Mo’ mode introduced on the iPhone 5S (albeit only the 120fps option), and ‘Burst’ and ‘Time Lapse’ modes are also available thanks to iOS 8. The front-facing ‘FaceTime’ camera hasn’t been left out, and has seen some improvements too, including a better sensor that will take in 81 per cent more light. You won’t notice it much in well-lit situations, naturally, but for indoors, at night, there is noticeably less noise and a clearer picture. If you’re an iPhone or Mac (with OS X Yosemite) user, you’ll get added functionality from the new iPad thanks to the new Continuity features. This means you can start doing things on any one of them and pick up where you left off on another. This works with most of Apple’s main apps, including Mail, Safari, Pages, Numbers and Keynotes. You can now also control calls and messages through your iPad (as long as your phone is nearby), answering calls using the speaker and replying directly to both iMessages and SMS. It’s a seamless experience and a nice touch for current Apple users. There’s absolutely no doubt that Apple has done it again. This is the iPad to beat all iPads, and is still the best tablet on the market. Yes, its restrictive nature does make it a little pricier, gigabyte-for-gigabyte, than competitors that allow you to expand via microSD, but the 64GB version is now offered for the same price that 32GB was previously. At least it’s something. Invest in the right storage for your needs (and we would suggest 64GB or above), and you’ll never be disappointed by the iPad Air 2. It offers a stunning performance, excellent screen and unrivalled user experience, all wrapped up in a super-slim and premium design with an app selection that’s impossible to beat.